Apple has just made available to download iOS 10.3.3 beta 5 to developers registered on the Apple Developer Program portal. The release comes less than a week after iOS 10.3.3 beta 4 was released, and only a couple of days after Apple made iOS 11 public beta 1 available to members of Apple Beta Software Program portal. Given that iOS 10.3.3 beta 5 is a relatively minor release, it’s kind of strange that Apple has gone as far as releasing five different beta versions for it. Maybe there was a last-minute showstopper bug that Apple wanted to fix before rolling out the firmware to masses? Or maybe with iOS 11 development and testing in full swing, the 10.x series has taken a back seat at Apple? Coming back to changes in iOS 10.3.3, apart from including couple of new wallpapers for iPad Pro models, there’s nothing new in the firmware to write home about. It includes the usual bug fixes, security patches and under-the-hood improvements to make overall experience of using iPhone, iPad and iPod touch devices better than before. 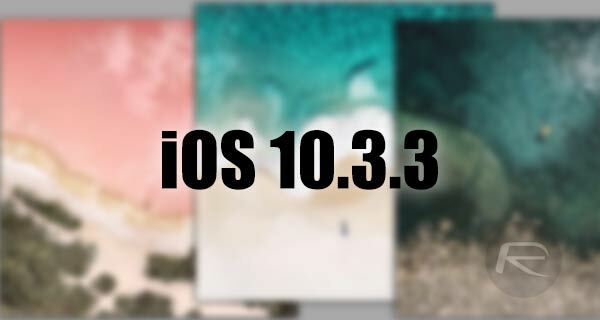 With Apple having stopped signing iOS 10.3.1 as of yesterday, and with iOS 11 betas out to both developers and testers, it’s only a matter of time before iOS 10.3.3 is out to general consumers. For the time being, if you are a registered developer or tester of Apple Developer Program with a configuration profile for iOS 10 betas installed on an iPhone or iPad, you can grab today’s beta 5 OTA update of iOS 10.3.3 from Settings > General > Software Update section of the device. If this is the first time you are looking to install iOS 10.x betas, you will need to head over to developer.apple.com to get started. Apple hasn’t made iOS 10.3.3 beta 5 available to Apple Beta Software Program testers yet but whenever they do we will update the post accordingly. Stay tuned. Update x1: Alongside iOS 10.3.3 beta 5, Apple has also seeded macOS 10.12.6 beta 5 to developers.